"CHicon, Terrence and Kyle were great. My system did not have a valve check and they were able to resolve the issue as to why my..."
CHicon, Terrence and Kyle were great. My system did not have a valve check and they were able to resolve the issue as to why my basement was flooding. "Both Installers were outstanding Kyle installed the Sani Dry and Victor and his crew installed the rest a few days latter"
"ALL YOUR PEOPLE ARE REALLY GREAT AND WELL TRAINED - KYLE WAS JUST A DREAM TO DEAL WITH"
"We have WaterGuard TripleSafe® Sump Pump System installed in 2012. Ever since we have annual maintenance of the same. Each..."
We have WaterGuard TripleSafe® Sump Pump System installed in 2012. Ever since we have annual maintenance of the same. Each year we have different engineer coming in and they are all very courteous, prompt (always called at least 20 min before showing up at our door step and within the previously given time frame). They are very knowledgeable and patient to answer any questions that you might have regardless are the questions about your current system or something that you would like to do in future. Yesterday we had Kyle. He was superb! From now on, and if possible, we will always request Kyle. Thank you guys. Very helpful, very courteous, very professional! It is always a pleasure to deal with your service techs, I can truly appreciate the fact that you train your employees and they go beyond what is asked of them. Than You ! Great guy! Professional and knowledgeable. Did a great job cleaning the sum pumps. Technician seems to enjoy his job and knows what he is doing. Your Service Tech was courteous, Very friendly & work conscientious. was a pleasure to have him recommended to anybody. Service manager and service tech (Sha' Con Kasey) and (Randy Halal) was patient and assisted with repair immediately. Very professional mannerism. Kyle is very nice, informed us of options and addressed concerns. Very personable. Did work weekly. Polite. Kyle was great. He was here on time, took his time, was pleasant, answered questions. Good technician. Meet Kyle, our field supervisor! He has over 12 years of customer experience in the Telecom industry, troubleshooting, diagnosing, and resolving problems. All this experience has made him an asset to Quality 1st Basements, for he completely understands the importance of great customer service. Kyle is always eager to help his team and our customers and so after working many years in our Service department, Kyle was promoted to Field Supervisor where he would be able to help our crews and our customers during the installation process. Kyle spends his spare time with his wife and children. He enjoys working out and participating in World-1 Pro Wrestling PretzelMania! Burlington, NJ homeowner reached out to us because they noticed the floor above their crawlspace had a horizontal cracks and was continuously expanding at a 45 degree angle. We sent Senior Foundation Specialist, Jeff Nero out to inspect the crawl space to see what structural foundation issues were causing the floor to crack and settle. Jeff noticed the crawl space beams were sagging causing the floor to shift and cracks to form. He suggested SmartJack Stabilizers be installed underneath the beams to provide additional support. These SmartJack Stabilizers can be adjusted to gradually lift the crawl space beams back towards their original state. This system will also prevent future settlement and structural damage. Check out this amazing before and after work completed by foreman, Esau Aquino and his team! A homeowner in Ewing,NJ had water coming into their basement. Quality 1st Basements installed WaterGuard and a TripleSafe Sump Pump to solve the problem. Our Basement Waterproofing team led by Esau, made sure to leave the basement cleaner than they had found it. The customer was extremely happy with the end result and they no longer have to worry about water in their basement now having the ultimate protection! Quality 1st Basements installed ThermalDry Elite flooring that looks and feels like real wood. All of our ThermalDry Flooring options are waterproof and mold resistant, making them great products to have if you are concerned with potential flooding. Check out this amazing Basement Transformation! System Design Specialist, Steve and our Foreman Mario worked together with the homeowner to completely transform this damp basement into a dryer and healthier space! We installed our WaterGuard Drainage System, a TripleSafe Sump Pump, IceGuard and our CleanSpace Vapor Barrier. Quality 1st Basement Systems installed a TripleSafe Sump Pump in the basement of this Hillsborough Township, NJ home. In case of a power outage, the UltraSump Battery backup sump pump will pump 11,500 gallons or more on its fully charged battery. This sump pump provides ultimate protection for any homeowner who has ever experienced water in their basement. A homeowner in Lacey Township, New Jersey noticed a crack in one of their basement walls. After doing some research online, they came across a before and after from the Quality 1st Basements website of a foundation with similar cracks. Looking no further they called right away for an estimate. A the time of the estimate, the Foundation Repair Specialist did a full evaluation of the basement and noticed two smaller staircase cracks along with the visible crack the homeowners first noticed. the Foundation Repair Specialist recommend CarbonArmor Wall Reinforcing System. CarbonArmor is a state-of-the-art solution for cracking foundation walls. CarbonArmor are strips made from a fiber reinforced polymer that is 10 times stronger than steel. The straps are attached to the wall and secured with heavy duty steel brackets. The straps will stabilize the wall and begin to pull it back to its original position. This system installs quickly and will prevent future problems. When they noticed their basement wall was cracked and bowing, this homeowner contacted Quality 1st Basements for a solution. Our senior Design Specialist, Ken P., provided the homeowner with a designed solution that best fit the needs of this homes foundation. This included the installation of the CarbonArmor System. Wilver, our project Foreman, and his team headed out to the site and installed Our Reinforcement Wall System. The walls are now completely stabilized and the homeowner no longer has to worry about their basement wall caving in. This system provides the ultimate solution since it will now prevent future movement, it can be adjusted to gradually pull the wall back towards its originally position and finally it can be covered if the homeowner decides to finish their basement. Our Moisture Vapor Barrier known as CleanSpace, was installed to the walls of this Basement to prevent moisture and water seepage through the foundation walls. The CleanSpace will force any water coming through the foundation walls directly down into the our WaterGuard Drain system that directs all water over to the sump pump. When the homeowner is ready to finish their basement, their investment will be protected against any basement flooding or water seepage that could have damaged the finishing products such as drywall or carpet. Our team encapsulated and insulated the space to eliminate musty odors and high utility bills experienced by the homeowner. Since this homeowners furnace and water heater were located in their crawl space, they were over worked in the winter and summer due to the uncontrolled temperature in the crawl space. The SilverGlo Insulation helps to keep the space warm in the winter so the furnace and water heater are no longer over worked! The CleanSpace Vapor Barrier prevents mold and moisture from forming int he crawl space therefore protecting the wood beams in the crawl space was rotting. Overall these products promote a dry and healthy space underneath this home. 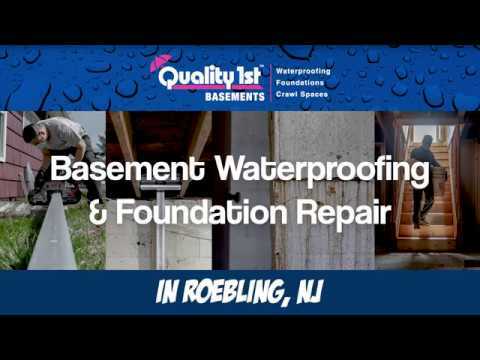 A homeowner in Woodbridge Township, New Jersey had water coming into their basement during heavy rain in their partially finished basement. The basement was waterproofed, but also needed a new sump pump. The existing sump pump was not working and outdated. The TripleSafe sump pump was installed to replace the old sump pump. The TripleSafe has three levels of pumps built in to ensure the basement stays dry. In case of any pump failure, the next lower level pumps will kick in to keep the basement dry. The TripleSafe sump pump will make sure this basement stays dry and healthy so the homeowners can use it. The existing columns in this basement could no longer support the weight of the home. Our Senior Design Specialist, Jeff N. designed a solution that would add additional support the foundation needed for this home to be stable and therefore safe. Esau, our Foreman and his team were in charge of this project to make sure the installation was completed on time. By successfully installing our SmartJack Stabilizers, the homeowner no longer has to worry about sagging floors and weakened columns. Check out this amazing before and after! Our team installed our ThermalDry Elite Plank Flooring which is made from 100% inorganic materials, making it completely waterproof and mold-resistant. This is a great product to have in your basement for it actually keeps the floor a few degrees warmer then a regualr flooring or carpet. Check out this CleanSpace Crawl Space Encapsulation our team installed in Hazlet, NJ. Encapsulating your crawl space prevents mold growth, keeps bugs and small animals from living entering the space, and improves the air quality in your home! A Whippany, NJ homeowner was experiencing water through their basement walls during heavy rains. Quality 1st Basements installed CleanSpace Wall System whihc can hold back water vapor passing through the foundation walls, directing it to the sump pump. CleanSpace also provides anti-microbial protection called UltraFresh built right in, so no mold or mildew will grow on the CleanSpace. Part of the process of waterproofing this homeowners basement included the installation of Ice Guard. The Ice Guard System is designed with openings that allow water to flow out and away from your home if your pipes freeze. By installing Ice Guard, you won't have to worry about water coming back into your home during colder months due to frozen pipes. Quality 1st Basements installed Push Piers next the footings of the home and are attached with a heavy duty steel bracket. Once the home is stabilized and lifting is complete, the soil is back filled, where they stay out of site. We recommended the Push Piers because they are a permanent solution for a settling foundation when the soil conditions below are unknown. Senior Design Specialist, Ken Peare, met with a homeowner living in Long Branch, NJ about water issues they had in their basement. Ken noticed several small puddles in corners of the basement. He also noticed high humidity and a musty odor throughout the entire area. He recommended a WaterGuard drainage system and a TripleSafe Sump Pump to prevent future leaks and flooding. He also recommended a SaniDry dehumidifier to circle dry air, preventing moisture and musty odors from forming. A homeowner in Long Branch, New Jersey had water coming in their basement through the floor when it rained. The homeowner contacted Quality 1st for a solution. Our System Design Specialist inspected the basement and noticed the signs of water. WaterGuard was installed along the perimeter of the basement underneath the floor slab, on top of the foundation footing to keep the system out of the mud zone, to prevent clogging. The WaterGuard collects the water that is seeping in through the basement walls and directs it to the sump pump. The TripleSafe sump pump was installed in the basement to pump out the water and keep the basement dry and healthy. The TripleSafe has three levels of pumps included in case of one failure and this ensures the basement stays dry. A dehumidifier, SaniDry XP was installed to filter the basement air of any moisture and mold. This dehumidifier stands upright and can be easily stored so it does not interfere with the basement. After their existing sump pump failed, causing their basement to flood, this homeowner contacted Quality 1st for a solution. System Design Specialist, Mike F. provided the homeowner with a written proposal for the solution he designed specifically for this basements needs taking into consideration its size. Our team led by Wilver, installed a full perimeter waterproofing system with WaterGuard and our SuperSump Sump Pump.